Secure everything, no matter the distance, you should prepare your yacht it as if it were crossing the Atlantic Ocean. Secure anything that can move or be damaged during the voyage. Hatches, doors, cupboards and windows should all be sealed with tape to avoid leaks and possible water damage through ingress. Also remember lock all exterior doors. Make sure the boat transportation company offers voyage insurance that will adequately protect your vessel if anything should go wrong. Inform the yacht transportation company of your vessel’s specifications in advance. Make sure the measurements are accurate, because they shall allocate this space for your boat accordingly. Inspect your boat for damages and take pictures to document any that already exist. If any items are dismantled prior to transport to prevent them from getting damaged, be sure to take pictures of their location and set-up to make re-assembly easier. Remove all personal effects and store any fragile items in a safe place. Your boat may be traveling on another boat, but it’s still going to experience the force of the ocean. 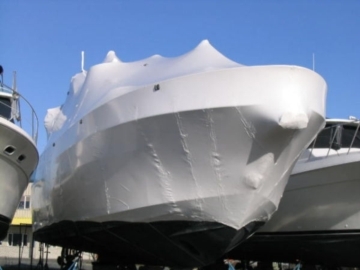 Apply protection to the exterior of your yacht with shrink wrap or similar material to prevent deterioration from exhaust soot, salt & sun etc. If your vessel is too large to cover completely, just stick to the most vulnerable areas such as teak and non-skid surfaces. Deliver your ship as light as possible. Empty all fuel and water tanks, however keep enough on board to get to and from the transport ship. Remove anchors from the deck, remove drain plugs from the hull and make sure there is no water in the bilge. You may also want to flush and sanitize your tanks with a chlorine bleach solution. Power down & switch off everything, unplug your batteries and store your cables to prevent any contact. You don’t want dead batteries when your vessel is offloaded at your destination. Prepare all documents and paperwork such as original boats registration, insurance, bill of sale and all necessary customs paperwork. 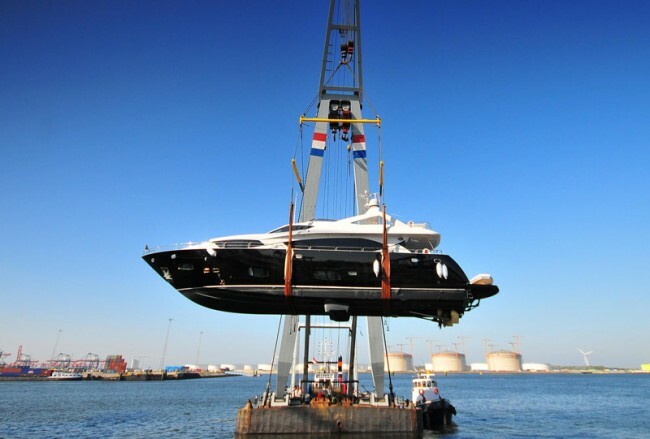 Contact Acronautic for expert advise in preparing your yacht for transport.